Suffering from Sleep Apnea? You could have a serious condition. Sleep apnea can cause death. Breathing pauses can last from a few seconds to minutes. These events can occur between 5 and 30 times or more per hour. Typically, normal breathing then starts again, sometimes with a loud snort or choking sound. Doctors usually can’t detect the condition during routine office visits. Also, there are no blood tests for the condition. The most common type of sleep apnea is obstructive sleep apnea. This most often means that the airway has collapsed or is blocked during sleep. The blockage may cause shallow breathing or breathing pauses. When you try to breathe, any air that squeezes past the blockage can cause loud snoring. Kootenay Smile Studio has the technology to help diagnose your risk for sleep apnea. 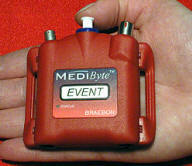 The Medibyte Junior is a 6-channel screener, which can record up to 2 nights in a row on 1 battery. It’s ideal for use at home to screen sleep apnea. The device is small and light in weight and is CPAP compatible. It can monitor your heart rate, flow (pressure transducer), snore (derived from pressure), body position, CPAP flow, CPAP pressure.